An impressive early 20th Century English mahogany and chased gilt brass bracket clock with eight day twin fusee movement striking and chiming on eight bells and four gongs, went under the gavel at Toovey’s Specialist Sale of Clocks and Watches on the 8th November. 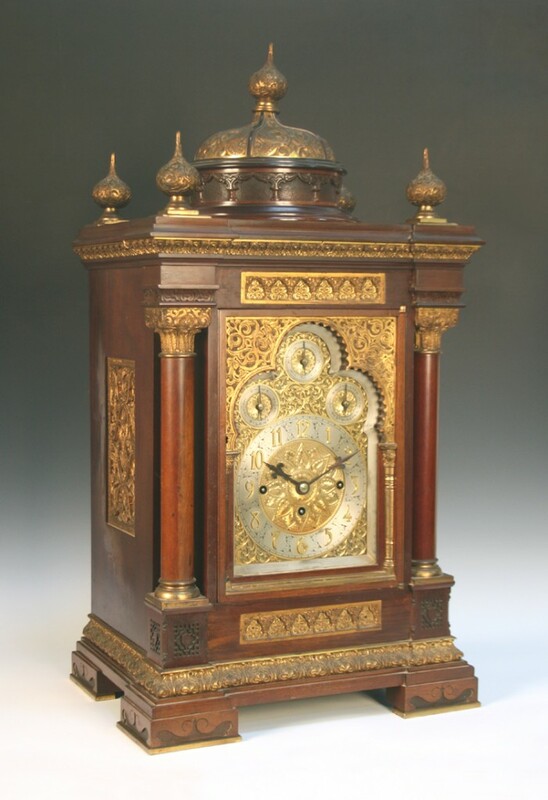 The bracket clock sold for £7000 to a couple in the room against strong competition from several telephone bidders. The 87cm tall bracket clock had a brass arched dial with silvered circular ‘slow/fast’ indicator flanked by silvered ‘chime/silent’ and ‘Whittington/Westminster’ circular indicators, above a silvered chapter ring with gilt Arabic numerals framing an engraved foliate centre, all within a frame of pierced scroll fretwork. The India inspired mahogany case had finely chased gilt brass mounts and was surmounted with a large dome flanked by four smaller dome finials. This clock was featured in a full-page advertisement of an ‘English (London Made) Bracket Chiming Clock’ that appeared in the Grimshaw Baxter & J.J Elliott Ltd catalogue sometime after 1909. The advert suggested the clock was intended for the overseas market, with India the most likely destination. Today however, the purchasers in the room were underbid by specialists in China rather than India, either way it remains in the UK for a little while longer. We close for Christmas at 11.30am on Thursday 20th December. We reopen for pre-sale viewing of our End of Year Sale on: Thursday 27th December from 10am to 4pm and the sale day: Friday 28th December from 9am to the start of the sale at 10am. All enquiries regarding this sale will be answered on our return. After the sale, we are then closed again from Saturday 29th December to Tuesday 1st January. We return to our normal opening hours on Wednesday 2nd January. We would like to take this opportunity to wish all our clients and friends a very happy Christmas and a peaceful and prosperous New Year from all of us at Toovey’s.